I’m part of the creative team for the iTalk group on Brigham Young University-Idaho. The group has three major events. One is a symposium called WeTalk, a debate-style event called TheyTalk, and a Ted-Style event called iTalk. 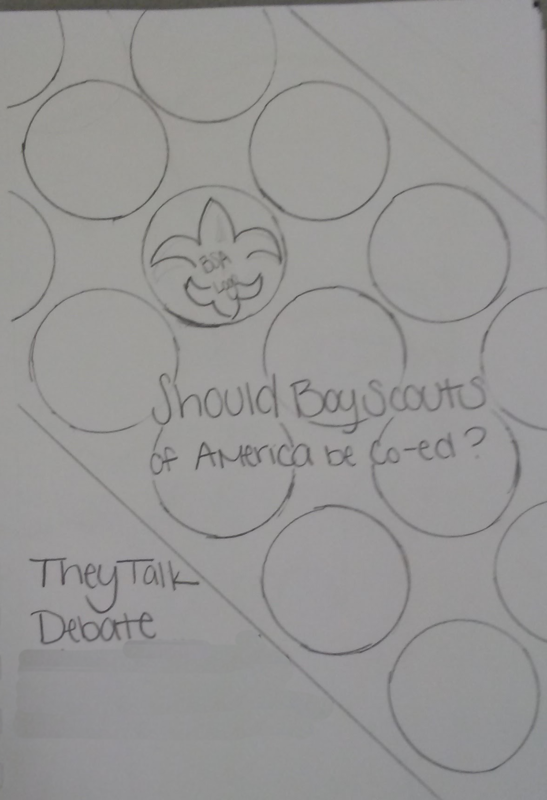 For the TheyTalk event coming up, the topic was about whether the Boy Scouts of America should allow girls into their programs. My creative team was assigned to make a poster for the event. One of my co-creators, Brittney, designed the poster, and I digitized her design. Original Sketch from my co-creator Brittney. For security purposes, the time and place of the event have been removed. As you can see, it was fairly straightforward, and I added details as I recreated it digitally. I decided to add the gender symbols to the merit badges, as well as created edges for the merit badges. In scouting, the silver edge means that the badge is required, so I felt it was appropriate to do that here. Here is the final design. Once again, the time and place have been changed for security purposes.